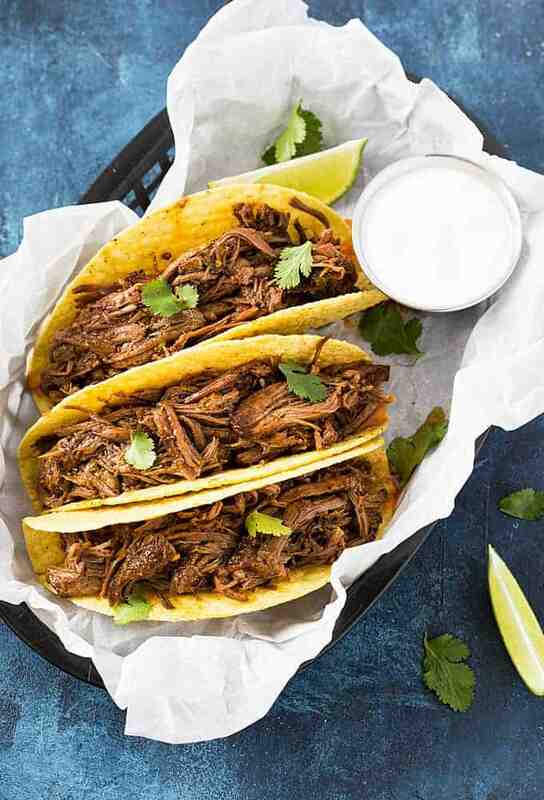 So tender, moist and flavorful… this Slow Cooker Mexican Shredded Beef is a MUST MAKE for your next taco night! 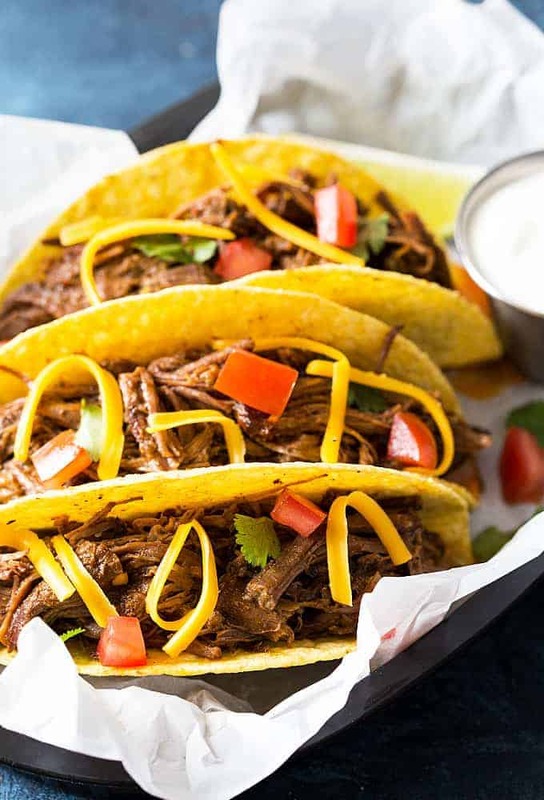 But don’t just limit this amazing beef to tacos. It’s awesome with nachos, enchiladas, and burritos. Or you can just eat it with a fork like I do sometimes. 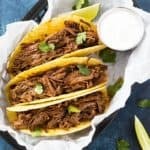 I couldn’t help but to totally pack this perfectly seasoned, moist shredded beef into my tacos! It also freezes well for make-ahead dinners. This recipe feeds about 6 (depending on your crowd’s appetite). 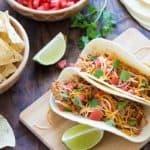 It’s a no-fuss, EASY and delicious way to enjoy taco night! 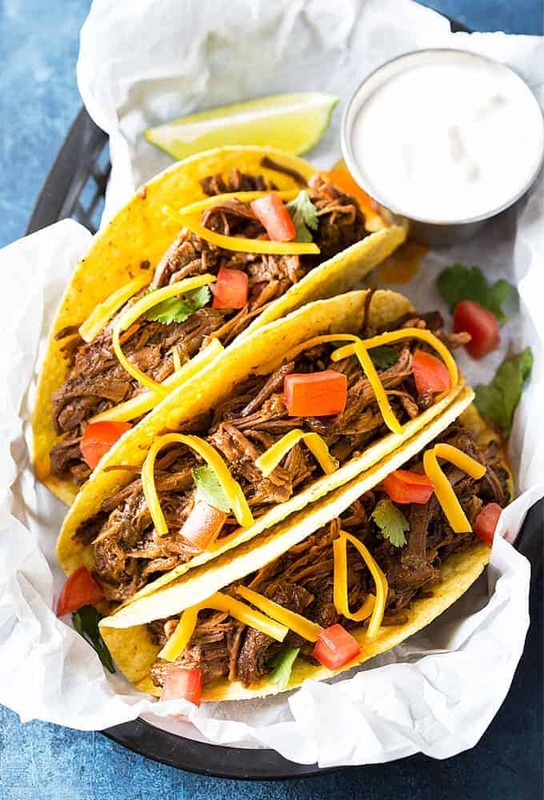 The most tender, moist and flavorful pulled Mexican beef! In a small bowl, combine salt, pepper, cumin, chili powder, garlic powder, onion powder, paprika, oregano and crushed red pepper. Set aside. Place the roast in a 6-quart slow cooker. Sprinkle seasoning mixture over roast evenly. Top with salsa. Cover and cook on low heat for 6 hours, or until tender. 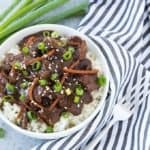 Remove beef from slow cooker and shred with 2 forks, discarding any fat. Allow fat to rise in liquid and skim off fat. Return beef to liquid mixture. Hi Amy , may I have a salsa recipe? 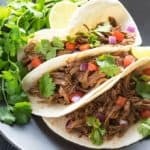 Do I need to add water if I’m using store bought salsa? 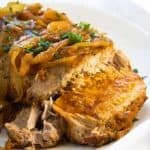 Hello, thank you for this great recipe! Do you know how many calories are in it? This recipe calls for a 3lbs Chuck roast. Well, the one I have is just under 2lbs. Much smaller. Should I still follow the recipe as is? I don’t want to dry out the meat. 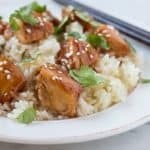 I’m a stay at home mom and I’m trying out several different recipes. Help a momma out! Please and thank you! Soooo yummy! 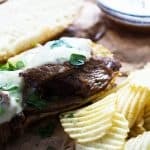 I used tri tip and it was delish! Thanks so much. Hi! Looks delish! Have you tried it with a still frozen roast? Not sure my beef will be thawed by tomorrow morning.